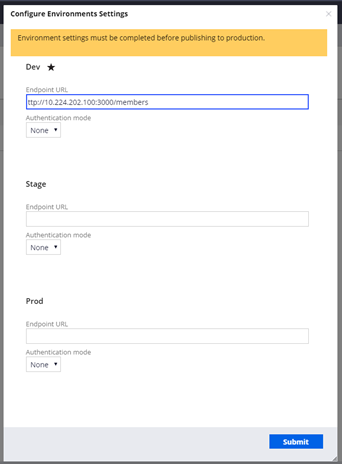 Easily manage your integration settings across the development, stage, and production environments. Specify the endpoint URL and authentication modes for each environment. At run time, the system chooses the appropriate values based on your environment. You can configure these environment settings when you add a new data type, update or replace a data source, or from the Data Views tab in the Data Designer. The following figure shows an example of the Configure Environments Settings dialog box. For more information, see Configuring endpoint URLs for environments.